Beside the river Tweed sits a large rock and rubble mound overlooking the present day village of Wark, all that is left of the ancient motte and bailey castle of Wark, or as it was sometimes called the castle of 'Carham' built by Walter Espec with the permission of King Henry I of England (1100-1135) in the early part of the 12th century. The site originally consisted of what appears to be an unusual six sided plan keep which was was five storeys high, "in each of which there were five great murder holes, shot with great vaults of stone except one stage which is of timber, so that great bombards can be shot from each of them" (1517 account). A wall encircling this keep curved round and down to link with the bailey courtyard wall. This wall itself was divided into two sections to allow the garrison to progressively retreat if the gatehouse was taken during times of siege. The gatehouse opened close to the Tweed as the river was fordable here and for added defence a trench ran from the river passed the gate house and up around the keep perched on it's rock mass. 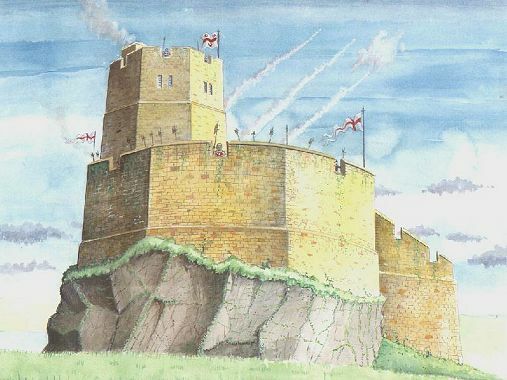 The castle was a very ugly building but it was an extremely functional structure taken it's position on the border marches and being under continual threat from the Scots. Though regarded by some as a minor castle when compared to the likes of Norham castle it still had it's part to play in the pages of border history. Wark was attacked by King David I of Scots (1124-1153) on three separate occasions in 1126 when it was taken and held by the Scots for a short time. It was then besieged unsuccessfully in 1138 while the Scot burnt down Northumberland. Then in 1139 it was again besieged when the English used it as a base for a retaliatory strike into Scotland. Eventually the garrison agreed to surrender on condition they could leave with their lives and possessions while the castle was slighted and made unserviceable. In 1157 Wark was rebuilt by King Henry II of England (1154-1189). But by 1216 it had again been destroyed by the Scots before being rebuilt again. In 1349 one of the most famous events at Wark took place when King Edward III of England (1327-1377) who was attending a court ball at the castle noticed that Lady Salisbury had dropped her garter. As he bend down to offer the garter back to the embarrassed Lady he saw some of his courtiers whisper and snigger. The King quickly rebuked them saying one day they would count themselves honoured to wear the garter. Hence the order of the Garter was established. In 1399 King Richard II of England was replaced by the usurper Henry IV (1399-1413). Since the peace treaty between Scotland and England had been signed during Richard's reign there was doubt as to it's validity. So to test the water the Scots burnt down Wark castle. In reply the following year the English tried to take Edinburgh castle. In 1419 William Haliburton, the governor of Fast castle, with only 23 men took Wark castle by surprise using ropes and grappling hooks. Some accounts say he slew all that he found therein, other accounts claim that while Haliburton negotiated the surrender of the keep from Sir Robert Ogle (since the courtyard had already been seized) he and his men were surprised by a fresh group of English troops who climbed into the castle through it's sewage pipe. All the Scots were killed and beheaded their bodies thrown outside while their heads were put on stakes upon the keep's battlements as a warning to other Scots raiders. In 1513 the English invaded France. Under the terms of the alliance between Scotland and France this was an act of war against Scotland. Consequently King James IV of Scots (1488-1513) with a large army invaded England. He then used the gigantic cannon 'Mons Meg' to bombard and slight the castles of Wark and Norham, while Etal and Ford castles were simply stormed. After this the Scots army was defeated and King James killed at the battle of Flodden. Wark castle must have been quickly repaired by the English as the 1517 account showed it to be fully equipped and operational, boasting a barrack/stable block in it's inner courtyard able to house 140 men and their horses. Making Wark an ideal location for mounting lightning cavalry raids into Scotland. In 1543 the English failed to bring about the marriage of the infant Mary Queen of Scots (1542-1567) to the English Prince Edward by bribes, hence from 1544 to 1549 they resorted to raids of fire and sword throughout Scotland to try and force this union. So the days became known as the wars of the 'Rough Wooing'. Wark and Cornhill tower along with several other English border keeps were used as bases to conduct such raids. In 1544 John Carr and a body of horsemen from Wark attacked Smailholm tower and village stealing 123 cattle and 8 horses. In June 1546 the Wark garrison raided Smailholm again stealing 60 cattle and taking 4 prisoners. In July they returned with the Cornhill garrison this time stealing only 6 cattle. These attacks by the Wark garrison eventually caused the Pringle family of Smailholm to become 'assured Scots'. Usually 'assured Scots' were Scots lords who favoured the marriage union with England and were willing to fight their own countrymen to achieve this goal. The Earl of Lennox for example as an 'assured Scot' used his war fleet to attack Rothesay castle and Dunoon castle on the west coast on behalf of King of England . Whereas the Pringles in this instance were so sick of the border fighting they wished to remain neutral and agreed in 1548 not to fight the English or help the Scots so long as their lands around Smailholm were left unmolested. Has been mony a man's deid"
After the end of the 'Rough Wooing' ,Wark appears have been repaired as shown in survey papers from the 1580's . But like Cornhill it was eventually abandoned with it's stones used in the 1700's to build other modern houses and walls nearby.